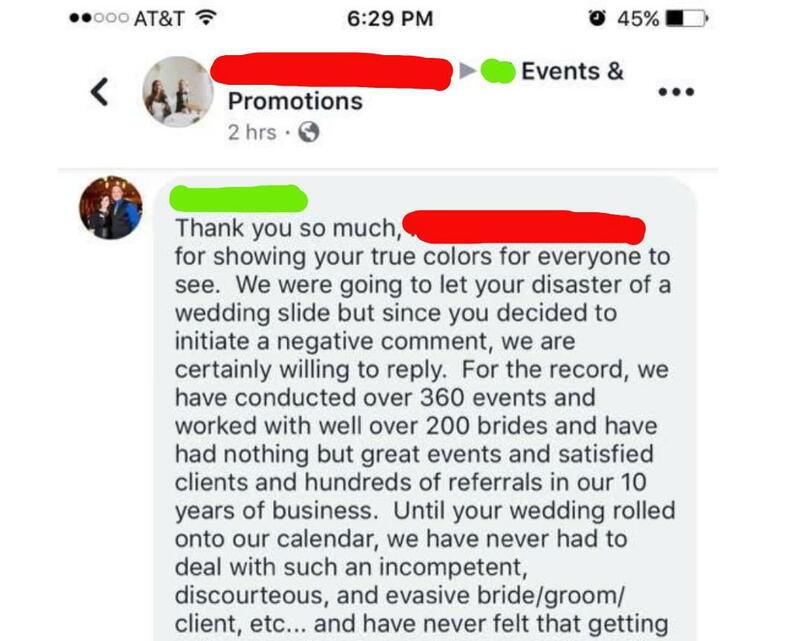 I don't know what it is about people getting their comeuppances that's so satisfying, especially obnoxious people who book events, like this dissatisfied bride I'm going to tell you about. 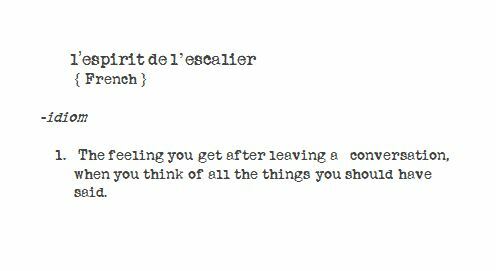 I think a lot of it has to do with the "spirit of the staircase," or L'esprit de l'escalier. It's a French term (duh), that perfectly captures a very common phenomenon: leaving a party or event or area where someone put you in an awkward position that left you speechless or unsure of how to act. However, it's only afterwards (once you've exited the space and are walking down the steps) that all the things you should have said start pouring into your brain. 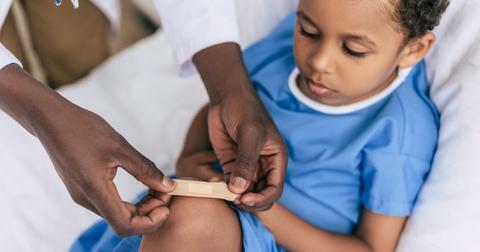 It's as if you were possessed with the knowledge — all of a sudden — of what you should do, except you've already gotten out of your sticky situation. So whenever someone, when pushed into a corner, decides to throw a proverbial punch against someone and shuts them down, it's a fascinating sight for many of us because we seldom see that kind of verbal destruction firsthand or do it in our own lives so perfectly. 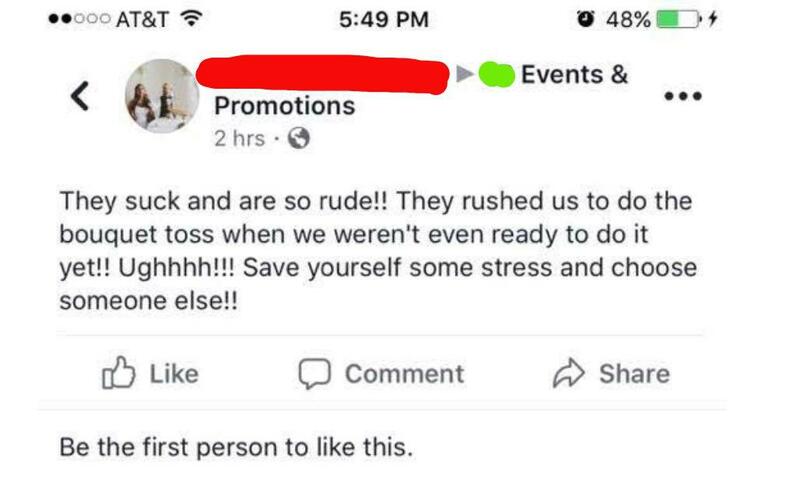 Which is why people are loving how savagely this dissatisfied bride got shut down when she complained about a company on Facebook who decided to say "screw it" to professionalism because in this case, the customer was not right. Not by a long shot. 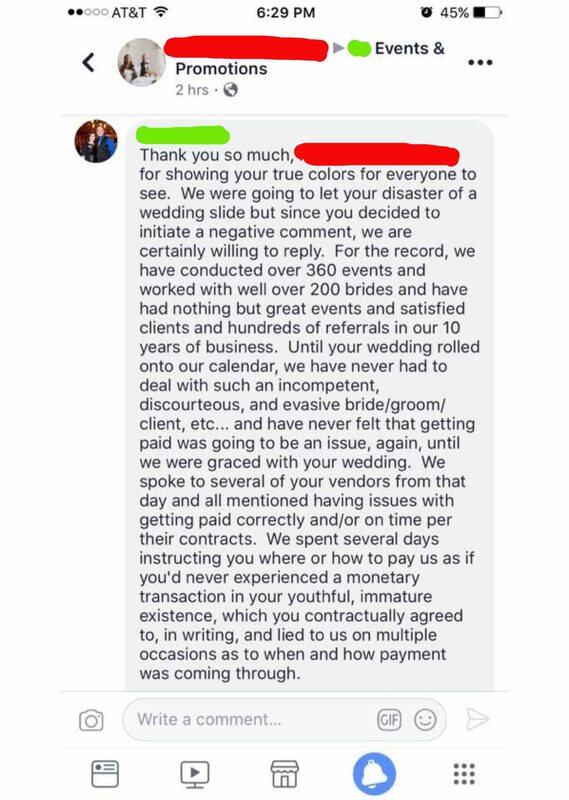 So the bride was very upset after feeling "rushed" to do a bouquet toss, so she gave the business a negative review for ruining her very special day. Here's the thing though: Negative reviews go both ways. And if you're going to complain about a company that can be selective with certain clients, then expect them to come correct with the full story and serve you, and the internet, all the facts. Which is what this redditor's boss did after seeing the couple's review. You can tell that the business owners were just waiting to get this off their chest and this kind of ire has been boiling inside of them for a very long time. Because they absolutely tore into this bride who was upset about her bouquet toss being rushed. 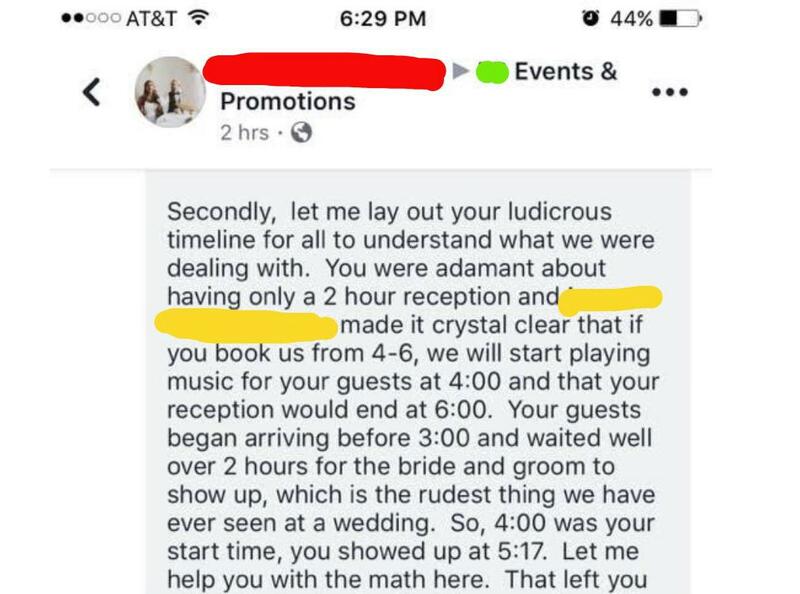 According to them, it wasn't "rushed" at all, the bride and groom just couldn't be bothered to show up to the venue on time. 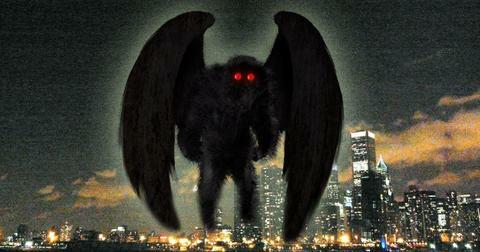 In case you thought they were done... No, no chance in hell. They unleashed a righteous invective on the bride, detailing all of the couple's horrible behavior leading up to the wedding, as well as the eventual day of. 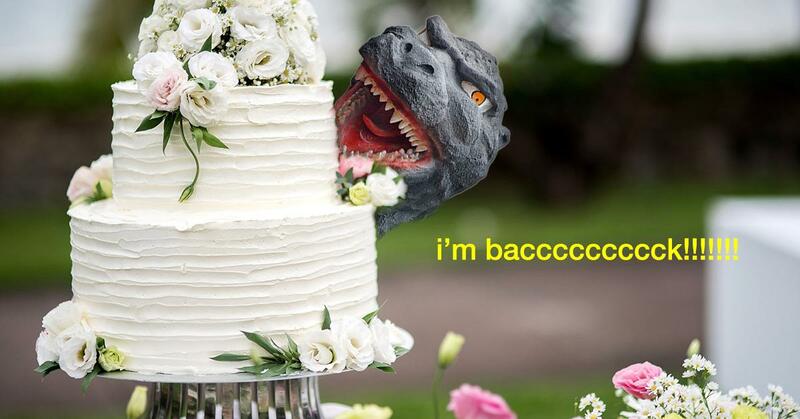 Honestly, as a guest to weddings that have never, ever, ever started on time, I can feel their pain. 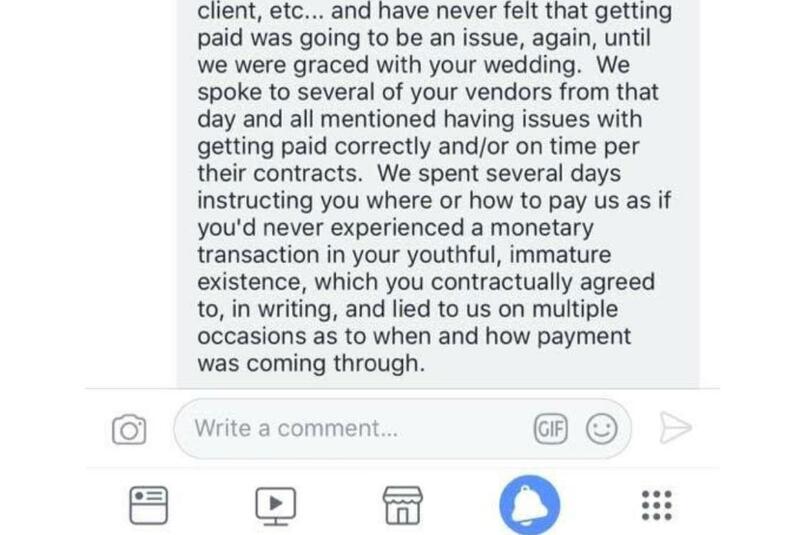 I can only imagine how frustrating it is when you go out of your way to make a client happy and they hem and haw with not only payment, but their respect of your time. 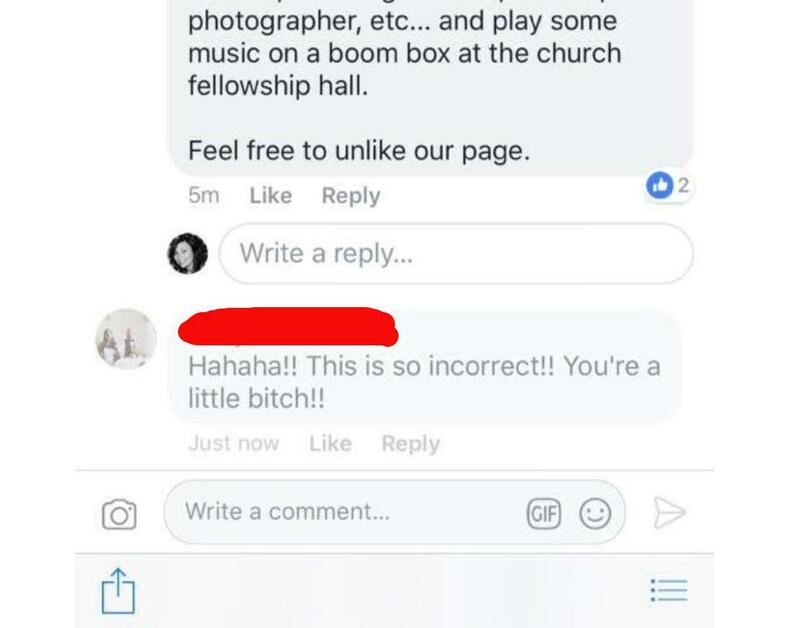 They decided to finish off their post by telling the bride to "feel free to unlike their page." If that isn't a modern day middle finger, then I don't know what is. There really isn't much anyone can say after being destroyed like that, unless they have some facts to answer back to the business and paint them in a negative light. 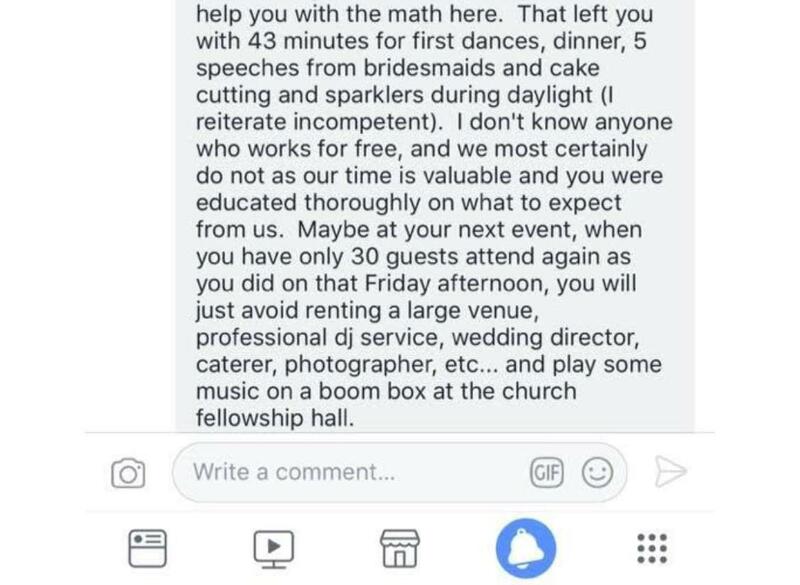 But I can assure you that this isn't the case, because the only response that the bride had to this diatribe is this infantile comment that's the dumb cherry on a cake of stupidity. Dang, someone call Omarion because this bride just got served. Something that a bunch of people on reddit seemed to enjoy thoroughly. Can you blame them? 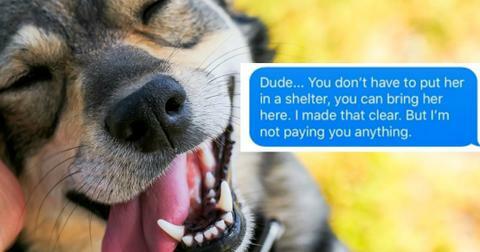 Others couldn't believe the nerve of an individual who would complain about a service when they behaved unprofessionally and didn't even bother to pay the people they were complaining about. Others were just soaking in the greatness, thoroughly enjoying what just transpired before their very eyes. And if there was any doubt as to whether or not the story was real, for many, that little, final comment from the complaining bride pretty much convinced them that it was. Bridezillas take note: If you're gonna talk smack, make sure you've got a reply ready for anyone who's gonna come at you hard.